Now that spring is busting out all over (finally), I thought we’d celebrate it with this gorgeous little piece from the Brooklyn Museum of Art. It’s one of my favorites in my little mental art museum. It is also yet another instance that confirms what I have always tried to get across: there was never a time in the history of art when women did not play a significant role, either as artists, patrons, or mentors. Born in Salem, Massachusetts, Fidelia Bridges was orphaned at the age of 16. At that age she developed what would be a life long friendship with Anne Whitney, the pioneer woman sculptor. The two discussed art and women’s place in society. Whitney encouraged Bridges, who had a growing interest in painting, to pursue a career in art. Bridges studied painting under William Trost Richards in Philadelphia. At the time he was influenced by the English Pre-Raphaelite movement that emphasized a detailed study of nature with botanical accuracy. Bridges set up her own studio in Philadelphia in 1862. Richards sponsored her among his wealthy patrons there. At this time she was exhibiting at the Pennsylvania Academy of Fine Arts. In 1867 she went to Rome for a year, staying with Whitney, who was now the head of a group of women artists who wish to work without the strictures of American society. After this trip Bridges began to form her mature style, quite apart from Richards’ influence. Bridges turned entirely to watercolor at this time. Her work varied little in subject matter throughout her career: close-ups of small fragments of nature such as flowers, grasses, and birds, focusing on minute details in vibrant colors. She was elected as an associate at the National Academy of Design in 1874. She also received many commissions for lithographic prints from Louis Prang and Company, a rival of Currier and Ives. By the 1870s, Bridges had moved away from the all-over detail of her Pre-Raphaelite-inspired style, at times moving toward almost Asian simplification of the subject. This piece is typical of her work from the 1870s with its dramatic emphasis of positive and negative space between the flower and the neutral background. 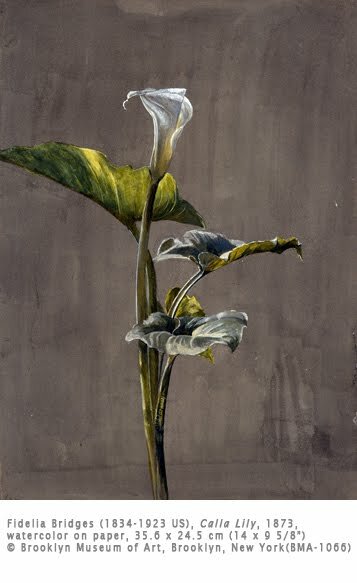 The Asian influence is also seen in the asymmetrical arrangement of the flower in the composition. Despite the simplification in the work, Bridges has managed to produce a work with an amazing amount of detail of natural light. Works such as this compare favorably with the “Flowers and Birds” series woodcuts of Hiroshige (1797-1858), although it is not known if Bridges ever saw such work. She was primarily influenced by the Pre-Raphaelite emphasis of focus on details of nature.